Roosevelt was one of the original ten stations of Chicago's first "L" line, the South Side Rapid Transit. The original station, which was a street-level facility just like all the other South Side stations outside the business district, had a brick exterior and a large bay in the center of the front elevation. The station had two side platforms with short "humpbacked" canopies. The station was one of 23 Howard, Jackson Park, Englewood and Ravenswood stations closed on August 1, 1949 as part of the CTA's institution of A/B skip stop service on the North-South Route. As part of the same service revision, the "L" tracks from Wabash/Van Buren (Tower 12) to 15th and State streets were abandoned after North-South Route trains were rerouted into the State Street Subway. 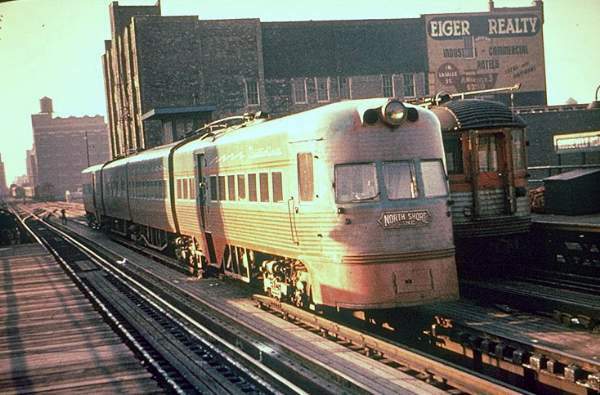 Although all "L" service to Roosevelt Road ceased on August 1, 1949, the facility continued in use as the Chicago North Shore & Milwaukee's terminal until the end of their service in 1963. Normal procedure was for a combine to be held open at Congress Terminal to receive baggage and merchandise dispatch shipments until about 15 minutes before a scheduled northbound departure from Roosevelt Road, then run half a mile south to Roosevelt to couple onto the coaches. After the North Shore Line ceased operation in January 1963, the station closed and was demolished. The tracks, however, were never torn down and were, in fact, put back into "L" service in 1969 when the newly opened Dan Ryan Line was routed onto the Loop via these tracks and a connection at about 15th Street. Still, due to its close proximity to the Roosevelt station in the State Street subway (about 1/2 block), no station was rebuilt on the newly reactivated line. Following decades of planning, work began on the new Southwest Rapid Transit line in 1987, connecting the Southwest Side, the only part of the city then without an "L" line, with downtown. The line was built relatively inexpensively (about $500 million) using old abandoned railroad rights-of-ways, including those previously used by the Illinois Central Railroad, Santa Fe Railway and the Belt Railway of Chicago. The new line connected to the old South Side Elevated at 17th Street, then used the existing elevated line to access the Loop. 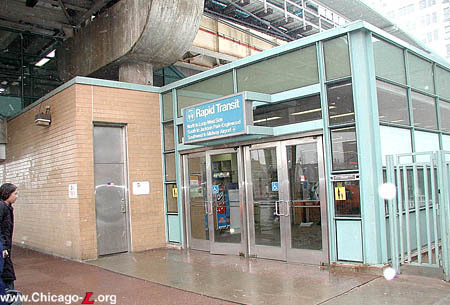 A new Roosevelt station was built on the South Side Elevated as part of the Southwest Rapid Transit project and ground was broken for the station in 1990. 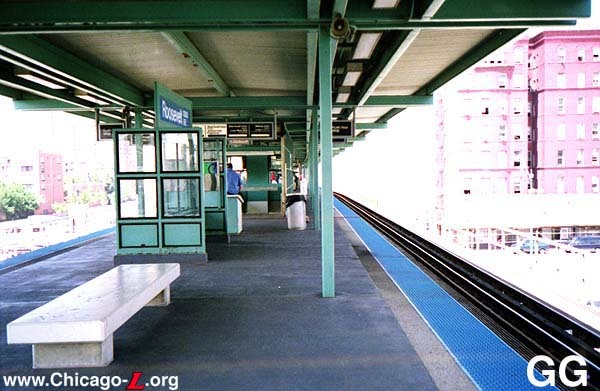 The Southwest Route entered service as the Orange Line, following the CTA's then-newly adopted color-naming convention, on October 31, 1993. Roosevelt station entered service the next day, Monday, November 1, 1993, at 0800 hours. One of eight stations built for the line, Roosevelt is typical of the facilities designed and built for the Southwest Rapid Transit line. The stations, designed in the late 1980s and early 1990s, are typical of urban design in general and transit planning in particular during that period. The general design of the station is typical of the other Orange Line stations, although there are a few differences at Roosevelt. Although there are rail-bus transfers available at the station, due to its more constrained site and denser urban setting the station house is situated at the sidewalk and there is no off-street bus terminal. There is also no park'n'ride lot. Design of the station facility was overseen by the City, who encouraged the architects to use distinctive styles for the stations while conforming to a basic uniform layout and footprint. The station house, located on the north side of Roosevelt Road, has a short facade of glass windows framed by steel panels and light green steel mullions facing the street, immediately east of the elevated structure. The part of the elevation under the elevated structure is merely a blank tan brick wall. The headhouse, whose long elevation runs parallel to the tracks, is topped by a thin light green-painted steel cornice. The interior of the station house is simple and typical of all Orange Line stations. The floors are concrete and the ceilings are made up of metal strip panels. The walls that do not have large picture windows are clad with the same tan brick used on the solid walls on the station exterior, punctuated by light green steel doors and moldings. Finishes in the building, such as the grilles, sign boxes, and the agent's booth, are stainless steel and tend to be rectilinear in design. 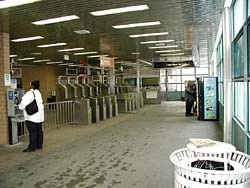 The original turnstiles, replaced in 1997 with AFC Cubic-made TransitCard turnstiles, were also very rectilinear. The booths are significant in that they were the first specifically designed not to primarily function as fare collection facilities. 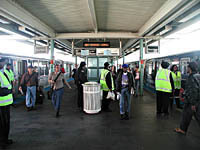 Although there were still ticket agents at the time (called "Transit Assistants" on the Orange Line) and "Customer Assistants" as we know them today would not exist for another four years after the station opened, the Orange Line was the first to prepare for the time when fare collection would be more automated. The agent in the booth did not collect fares, though they did verify reduced fare eligibility and accept transfers, and functioned more as an information assistant. Fares were to be paid at the turnstiles, and individuals that did not have exact change could use one of the Orange Line's specially-installed token vending machines. Following the installation of the AFC equipment, these machines were removed and standard TransitCard Vending Machines (TCVMs) were installed. The station also has a concession space. Two pairs of stairs and two escalators lead to the elevated platform, as well as an elevator, making the station ADA compliant and accessible. The interior has subsequently been outfitted with decorative painted benches and murals. The platform is of the island variety, with a concrete deck and a full-length canopy. The canopy has a flat roof, unlike the gable roofs at most Orange Line stations, and is supported by two rows of square steel columns. The canopy, whose columns and fascia were painted light green and underside was painted white, extends out to the centerline of each track. The platform is outfitted with flat concrete slab benches and glass and steel windbreaks, shaped like an "H" if viewed in plan, with a panel on top that holds a station name sign inside a frame. Behind each stairway is another windbreak waiting area. 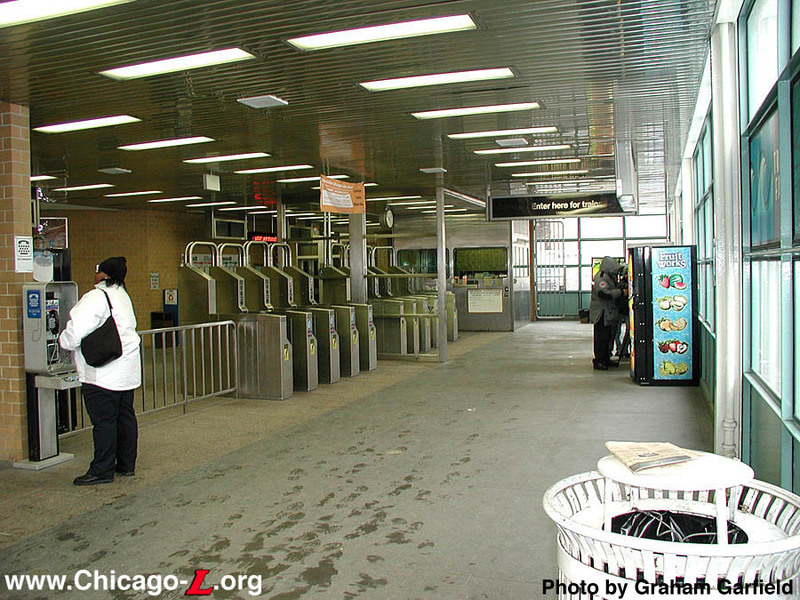 An auxiliary rotogate exit is located on the south side of Roosevelt Road, allowing passengers to transfer from the "L" to eastbound buses without crossing the wide, busy the street. The new station, the first on the site in over 40 years, serves both Green (Lake-Jackson Park-Englewood) and Orange (Midway) line trains. It also serves as the station for the new museum campus, about 5 blocks away on the lakefront. Roosevelt station received some signage upgrades recently. In 2004, the column signs were replaced with new ones with a Current Graphic Standard design similar to those they replaced (the original Modified KDR Standard column signs had been replaced years before). The overhead backlit directional signs on the platform were also replaced at that time, changing the verbose directions on the old sign faces to simpler roller curtain graphics. In late Spring 2005, the station name signs on the platform were replaced, with Current Graphic Standard signs replacing the Modified KDR Standard originals. Mayor Richard M. Daley introduced a plan to the City Council July 25th to demolish and replace the old Chicago Police Headquarters on State and 11th Streets with a new mixed-use development with residential, retail and parking components. 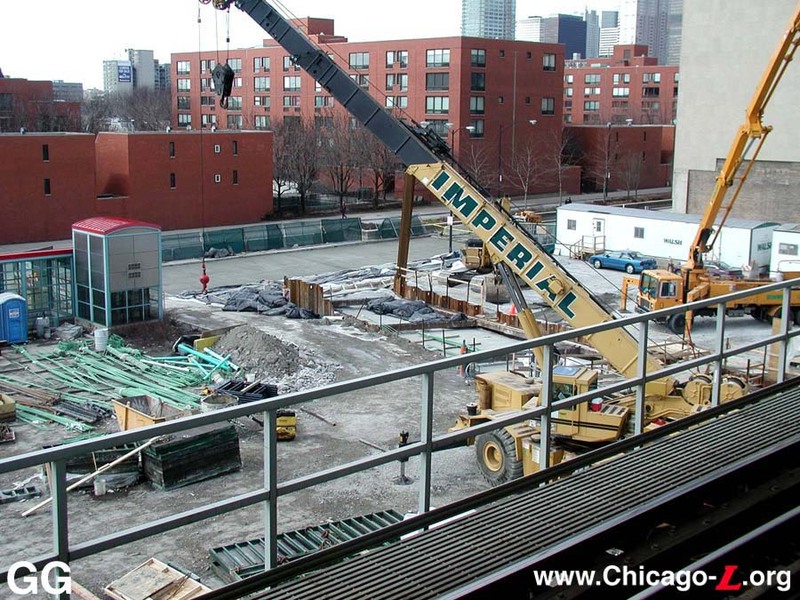 As part of the project, the developers worked with the CTA to build an underground connection on the southern end of the site from the Red Line Roosevelt/State station to the elevated Orange and Green Line Roosevelt/Wabash station. Such a transfer tunnel was part of the original design of the Roosevelt/State rehab in the mid-1990s, but was not completed due to cost problems. The Roosevelt Transfer Tunnel -- also known as the Near South Intermodal Transfer Tunnel -- was designed by Muller & Muller Architects for the Chicago Department of Transportation (CDOT). The budgeted cost for the project was $7.5 million, though the final cost is said to have been closer to $10 million. Funding was provided through Illinois FIRST and a federal Congestion Mitigation and Air Quality (CMAQ) grant. Work on the project began in November 2001. 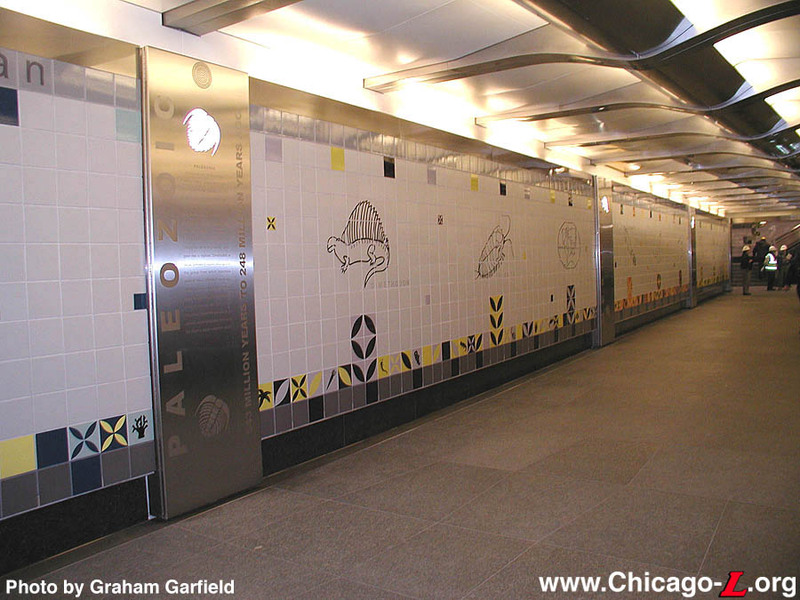 The aesthetic concept for the tunnel is a time line of history in conjunction with the three museums represented on the Museum Campus: the Field Museum of Natural History, the Shedd Aquarium, and the Adler Planetarium. 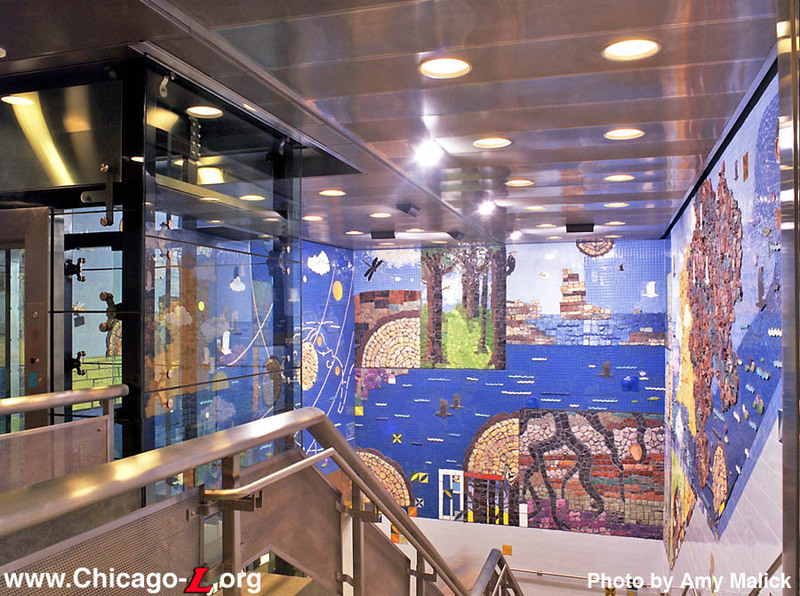 Additionally, there is dedicated space for the City of Chicago Art in Transit Program. 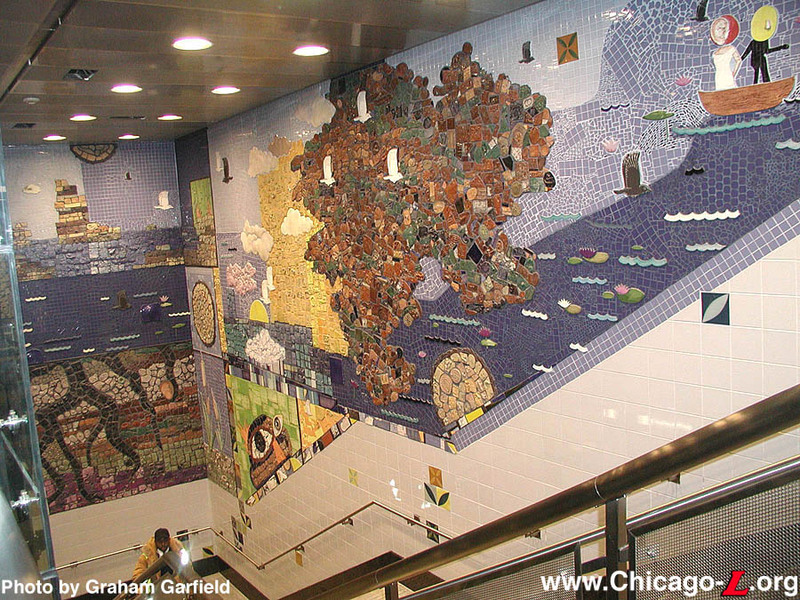 At the east end where the vertical access between the tunnel and the Green/Orange Line station house is located, the tunnel is adorned with a large mural composed of more than 4,000 colorful tiles created by visitors to the Museum Campus in 1999. 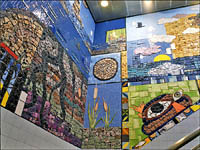 The mural, titled "Hopes and Dreams," was created by Juan Angel Chavez and Corinne D. Peterson of the Chicago Public Art Group. In recognition of the Museum Campus and its three institutions, it depicts clouds, forests, oceans, earth and space, representing the Field Museum, Shedd Aquarium, and Adler Planetarium, respectively. 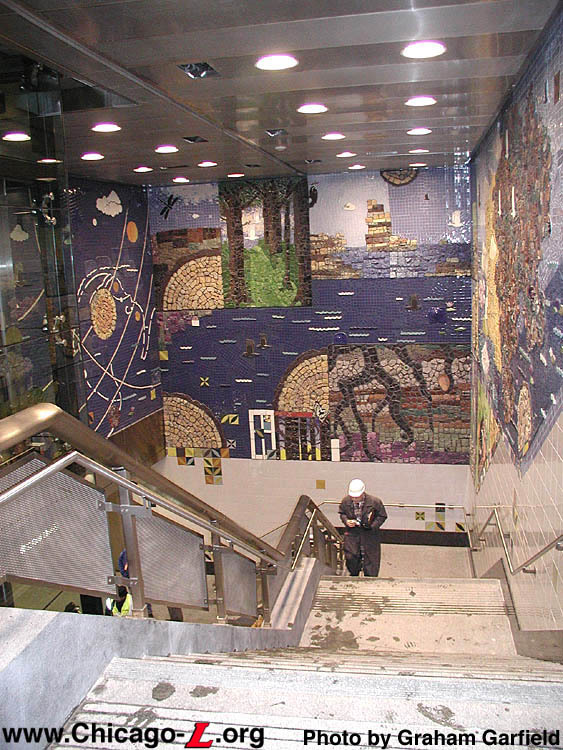 The walls of the tunnel itself displays a timeline of history, from the Big Bang to space travel, with pictures glazed into the tiles showing various plants, animals, and celestial bodies. These are broken up by stainless steel pilasters that have a cutout backlit shape at the top (again, a plant, animal, or celestial body). These mark the changeover between eras (i.e. Paleozoic Era, etc.) and there is text carved into them explaining the benchmarks in the history of Earth and the universe. The tunnel itself was excavated, dug in the cut-and-cover method, and was covered over with concrete decking. One of the construction team's first challenges was basil heath. Since it's near the lake, there is a high water table, and the clay earth there is saturated, making it very, very wet. To take care of that, a "mud mat" -- a thin layer of concrete -- was poured. Once it was excavated to the proper elevation and this mud mat was put down, a nice base was provided to work off. Actually excavating the tunnel was fairly simple because the structure was to be dug and constructed primarily under an empty lot. Sheeting was driven from the ground down on either side of the tunnel's footprint and extended far below the bottom of the excavation. Once the sheeting was in place, the general contractor, Chicago-based Walsh Construction Co., excavated the earth between the two parallel sheetings. The tunnel also features a granite paver floor and a stainless steel ribbed ceiling that almost resembles a mammal's ribcage and spine. In addition, the elevator serving the tunnel features stainless steel tubing and point-supported glass cladding, meaning the glass members will be attached to the steel tubes by means of pins at each corner. Thus, you can see through the elevator, and for security purposes, the CTA can see through its hoistway. So it results in both an elegant look and security as well. There is also soft music piped into the tunnel, creating a complete ambient experience. The music -- it's Muzak, to be precise -- was chosen by the Chicago Department of Transportation and consists of 12 individual tracks that continuously play on a 30-minute loop. As part of the project, the Roosevelt/Wabash station expanded northward somewhat. 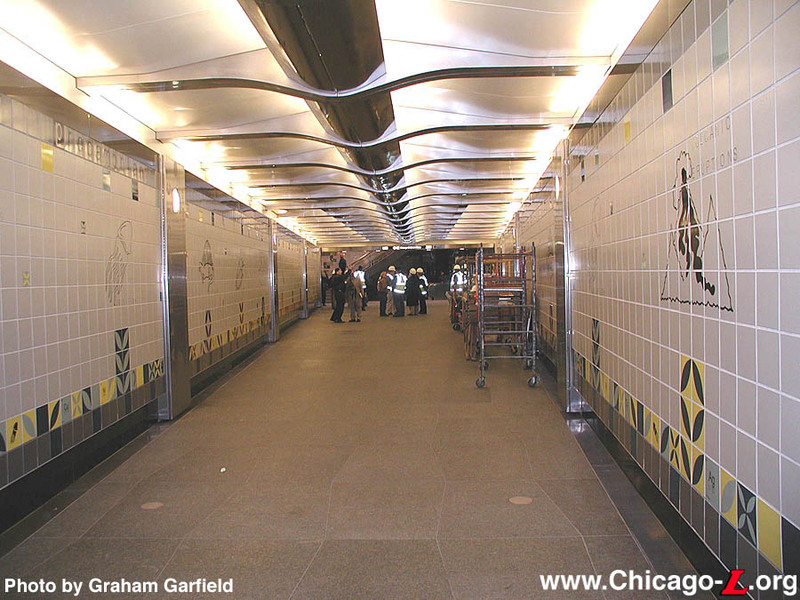 The tunnel connects to the Roosevelt elevated station by way of an elevator, escalator and stairs to the northwest corner of the grade-level station house, in the paid area. The tunnel emerges in the Roosevelt subway station on the east side of the mezzanine in the paid area, between the fare controls and the stairs down to the platform. Effective at 1000 hours, Monday, April 22nd, the elevator at Roosevelt/Wabash leading from the station house to the island platform will be taken out of service until further notice, approximately two months. 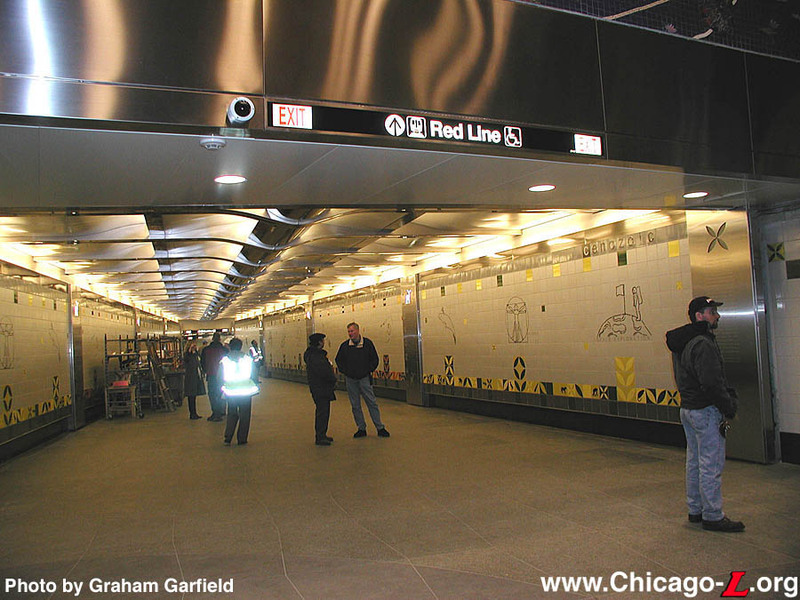 The elevator will be refurbished and the machine room relocated to accommodate the construction of a new tunnel connecting Roosevelt/State and Roosevelt/Wabash stations. The new Roosevelt Transfer Tunnel opened on Saturday, December 7, 2002. Although the companies the CTA has contracted with over the years to handle their station and railcar advertising -- Obie, Viacom, and most recently CBS Outdoor Advertising -- have long had the right to install advertising frames and ads at Orange Line stations, this right was not exercised for over a decade, leaving the Orange Line stations ad-free, somewhat of an anomaly on the "L" system. CBS Outdoor finally fulfilled this contract option in June 2006, installing freestanding advertising panels at all Orange Line station platforms except Midway (where there is insufficient room). The panels are lined up along the centerline of the platform, between the already-present benches, trashcans, windbreaks, elevators, and stair/escalator enclosures. In 2012, the CTA renovated the auxiliary exit at the Roosevelt Orange/Green lines station to provide a more convenient transfer between buses and elevated trains, and some additional improvements for the station as a whole. The $650,000 project converted the auxiliary exit on the south side of Roosevelt Road into an auxiliary entrance, with direct access to the Green and Orange lines on the elevated station platform. The existing exit enclosure was gutted and partially demolished, with parts of the side walls reused and a new front facade added to the renovated facility. The new south entrance is equipped with High-Barrier Gate (HBG) turnstiles, which require customers to already have a valid farecard to enter. 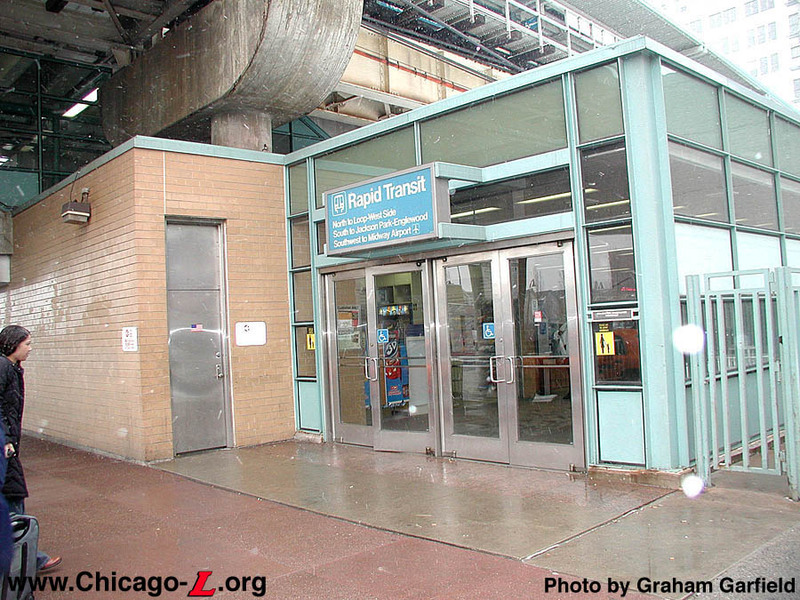 Farecard vending machines and staff assistance continue to be available at the main entrance to the elevated station or in the subway station, both on the north side of Roosevelt Road. The project also includes new lighting, new landscaping, and new signage. The improvement allows customers to transfer from buses eastbound on Roosevelt Road directly to the elevated station without needing to cross Roosevelt Road, as well as provide more convenient access for residents of the South Loop. The entrance's new enclosure and projecting canopy adds shelter for customers waiting for eastbound buses. In addition, the entrance doorway of the main station house on the north side of Roosevelt Road received a new architectural identity treatment including new signage, and new CTA "identifiers" were installed on the elevated track structure over Roosevelt Road to aid in the visibility of the station when approaching from a distance and to strengthen the station's identity. Mounted to the viaduct, each identifier includes a large CTA logo centered on a horizontal pole to attract attention from afar and provide remote identification of the station's location -- akin to the famous roundel that marks the entrance to London Underground tube stations. The CTA logo is flanked by bus and train symbols, denoting the transit services available at or adjacent to the station. Roosevelt's CTA identifier was the first of the viaduct-mounted type to the installed on the system (after the first a few months earlier at Granville), and the third overall to be installed after the backlit pole-mounted type added to the Roosevelt subway station in 2007. Work on the project began in mid-June 2012. To stage the construction, the auxiliary exit on the south side of Roosevelt Road was temporarily closed and the eastbound bus stop near the south auxiliary exit was temporarily relocated. The rebuilt auxiliary entrance opened at 2pm, Wednesday, October 31, 2012. The identifiers were installed in mid-November 2012. The new signage and entrance treatment at the main station house was installed in early December 2012. Remaining work was completed by the end of 2012.